By the early 1950s, the extravagant waterskiing shows at places like Cypress Gardens in Florida had ignited a rage for waterskiing that swept the nation. A sport that combined blue water, fast boats, beautiful women, and daring young men performing death-defying tricks under the summer sun was the perfect expression of America’s post-war exuberance. At the same time in Arabia, there were a lot of mid-20 or 30-something bachelors working for Aramco as drillers, managers, welders, pilots, engineers, dentists, and master machinists who made Half Moon Bay a waterskiing paradise. Sadly, there was a limited amount of bachelorettes to impress with their prowess, but if that didn’t work out, they still had a helluva great time speeding over the warm, clear water and eventually falling — to pinwheel across the surface to their doom. It was a great deal of fun. The water skiers got together for beach picnics and parties, so it was natural that during a wild New Year’s Eve bash they hatched a plan for something truly special. It boggled the imagination, a construct beyond the wildest fever dream of any Sufi mystic, a structure never seen before in the long history of the Arabian Gulf. They built a ski jump. Basically a plywood ramp built on an 8-by-16-foot raft floating on oil drums, much like a skateboard configuration that you’d see today, the front lip of the jump started below the waterline and ended with you 8-plus feet in the air trying to land without breaking something. I can pretty much guess how this beast got built in the shops - off the record. And I truly understand that Aramco’s transportation department somehow misplaced the work order that sent a giant flatbed Kenworth truck and a forklift to deliver a large, unspecified object to Half Moon Bay. However, I don’t have the slightest clue as to how it was officially allowed in the bay, anchored 50 feet offshore and about 200 yards east of the crumbling Coast Guard station at the head of the bay – about halfway to the Yacht Club on the point. I presume that there was a cordial outreach by the water skiers to the three or four totally neglected Coast Guard men living in the shabby building without even a boat of their own. A few cases of Pepsi and frequent hundred-pound bags of ice were much appreciated, so the guardsmen could not have cared less what these Americans did. They were there for smugglers, not water skiers. That summer is the golden age of ski-jumping in Saudi Arabia. One day, Milt and I drift down from the clubhouse a few hundred yards and watch maniac skiers hit the ramp and go flying into thin air – for better or worse. Everyone makes it off the ramp, but landings are problematic. Ski jumping is a bit flawed as a spectator sport because you have to wait for the boat to make a long loop back to the jump, if it comes at all. As the skiers thin out, we begin to lose interest and start drifting back to the club when we hear a screaming whine headed our way. It’s a sleek, Italian-looking runabout driven by a vainly handsome, bare-chested young man wearing a wide grin and mirrored aviator shades. Behind the boat is a long towline, so for a second, we can’t see what’s happening. It’s a long, thin line with someone at the end. The boat comes closer, and we realize that there is a petite woman at the end of the ski rope. At the last moment, the speedboat swerves and launches her onto the ramp. We finally realize who she is and watch our glamorous art teacher Miss Parker fly at least a dozen feet into the air and pin a perfect landing before she disappears across the water. By October, it was too cold to ski, and the jump was neglected. Winter storms snapped a couple of the raft’s anchor lines, some of the oil drums rusted through and flooded. By the next summer, the ski jump was a drifting, lopsided, broken relic covered with barnacles. Occasionally, some madman would attempt to jump it, but he’d be lucky not to fall and be shredded alive. However, none of this mattered because after months of agonizing about the cost of a boat versus the perpetual expenses of a family of six children, my dad Tom chose the boat. A mid-level manager at the time, comfortable enough, he drove a 1950 Humber pickup truck, had to watch his cash flow, and the boat was a reach. This decision was followed by a long, involved process to figure out what kind of boat. After lengthy discussions with his circle of experts and pals, my dad decided. It was late May when the shipment arrived. A fourteen-foot Grumman aluminum boat, a custom trailer to haul it, and a sturdy Evinrude outboard motor, maybe 50 horsepower - I don’t really know. My dad was always irked that the trailer cost nearly a third of the boat. The Grumman opened a whole new aquatic world to us. We were at Half Moon Bay every weekend. Trolling the coast for skipjack, lingering over fishing holes at the Third Reef. You could clearly see a 20-pound hamoor in the clear water 10 feet below and easily work your lure to within a foot of his gulping jaws. But these groupers hadn’t survived for eons by being stupid. Most of the time, they’d slowly move on. Somewhere embedded in the darkest recesses of a hamoor’s tiny brain, there is a line of code that says, “If it’s too good to be true, swim away.” And they did, except for the one or two guys that didn’t get the memo. One weekend, my dad, my brother Mike, and I took the boat about half way to Salt Mine Point. Nowadays it’s called Qarriyah where a sprawling, industrial complex of desalination plants pumps millions of gallons of water to Riyadh every day. Tom steered the Grumman right up to the shore and beached it in two feet of water. There was not a person within miles and, for as far as you could see in either direction, the long, straight beach was exactly as it was a thousand years ago―deserted. We hauled our supplies up to the high-tide line, built a fire, cooked our hot dogs, and watched the stars until we drifted off in our sleeping bags to the sound of very small waves lapping softly on the shore. My dad loved waterskiing. He was really good at it and, though he was in his mid-forties and wouldn’t have risked the ski jump in its heyday, he became quite agile on one slalom ski, slashing back and forth across the wake as my godfather Steve Furman, chewing on an unlit cigar, sped us across the bay. Eight years old and the size of a tall rhesus monkey, I was the spotter. A bright-eyed, lanky 14-year-old, my sister Annie was a natural athlete and terrific horsewoman with plenty of Gymkhana blue ribbons to her name. She was eager to waterski and mastered it almost immediately. To a passing Bedouin, the sight of our speeding boat trailing a very long rope held by a 90-pound girl, waving as she passes, would make no sense at all and definitely provide much food for thought. But Annie is having a great time. Tom is chilling at the wheel. The motor is purring, the Grumman is slicing through the water, and Half Moon Bay salt spray mists the air. All is good. And then it isn’t. I had just turned to look to the bow, and we both see it at the same time. There is really nothing we could do. It is less than a 50 yards ahead of us, and there is nowhere to turn. Tom couldn’t stop or even veer off because Annie might lose her grip. And fall into a giant swirling pod of jellyfish. He has to steer straight through it, and Annie just has to hold on or else. Near the end of summer, the jellyfish bloom. A very pale, almost translucent blue, they are about the size of half a soccer ball with a feathery fringe and a bunch of stubby tentacles covered with hundreds of spring-loaded stingers that fire on contact. They aren’t too bad to swim around because there are usually just one or two, here or there. However, under certain tidal and current conditions, they would be swept together into a giant cluster. A 150-foot circle packed tight with thousands of jellyfish caught in a strange and deadly Sargasso Sea. I spin to watch Annie. She hasn’t seen the jellies yet, but then the water turns pale with their multitude. She realizes what’s happening. My heart is in my throat. My sister will certainly die if she falls. White knuckling the tow-rope handle, Annie shifts into some other gear that she didn’t even know existed, sets her jaw, and breaks into a crooked grin as if this dangerous challenge is going to be more fun than ever. 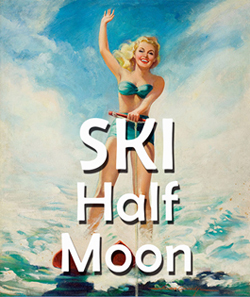 Her skis are slapping over jellyfish as if they are cobble stones made of small, squishy pillow cases. I quiver every time she cuts over another one. My dad is freaked out trying to get through this mess as fast as possible – but not too fast or she might tumble. I’m watching Annie, trying to decide. If she falls? Will I jump into all those tentacles to save her? And the pod never ends, I can’t even see the water, all I can see is Annie skiing over a living surface of pulsating, pale blue-white jellyfish. Her knees are shaking, her arms are trembling, her grin is now a straight line of grim determination. We’re almost out of the pod. Annie skis through the last 20 feet of jellyfish and into the clear water of the bay. Skis about another 100 yards before she falls - in the right place. Annie’s beaming when we pick her up. In the boat, my dad lifts her like a feather and hugs her closely. He’s so relieved and so proud of Annie. I’m still dumbfounded that she has defied an unimaginable death by poisonous tentacles. Annie takes off her bathing cap, shakes her hair out. She’s young, lithe, and beautiful, hopping up and down, triumphant and manic with glee. We’re all happy as my dad trolls along the coast a bit and then heads home. She doesn’t express an interest in skiing back to the Yacht Club.